The Waxing Moon means it is increasing in visibility in the sky for us. This is because it is moving from the New Moon to the Full Moon. In Moon Folklore, this is a time to visualize and use our intention to get what we really want. You have about 14 days to do this, so while you do The Moon Salutation during these days, take the opportunity to visualize yourself attaining your goals. Without the moonlight in the darkness of night, we would have to deal with total darkness all the time. This is a good reason for celebrating the the Moon. 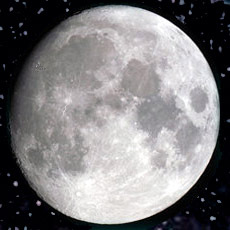 The Moon is also very similar to the earth as it rotates at the same speed. This is why we always see only one side of the Moon. As we float westerly through space, the Moonrise is later with every passing day. Think of waxing getting bigger, or waning getting smaller the last two weeks. Subdivide the 8 phases into fours: New, 1st Quarter, Full, Last Quarter. Each quarter is about 6-8 days long. When the Moon moves from the New Moon to the Full Moon, it becomes more illuminated. We call this Waxing. When it moves from the Full Moon to the New Moon, and becomes less illuminated, we call this Waning. All you need to do is learn this, and it is all quite simple. Look at the Moon phases on these pages to help you, too. Another way to remember is to visualize how the Moon rises in the East, just as the sun, to become a New Moon, and when the Sun goes down in the West, it is a Full Moon. My partner says he knows that the moon is getting bigger when the sun is setting, and when the sun is rising, the Moon's visibility diminishes. Find the best way to remember so that you can visualize the movements of The Moon Salutation to match the phases of the Moon. It's also easier to	remember the different movements if you can do this. As the moon makes it monthly journey around the earth, the side of the moon reflecting the sunlight is illuminated and viewed from different angles, but it almost always has its face in our direction. A complete cycle of the Moon's phases is called a Synod ic Period (aka Lunar Month). It takes approximately 29.5 days to complete. However, the Moon's true cycle is called the Sidereal Month. Just to understand the reasoning behind this—there is a difference of two days because of the Earth-Moon rotation around the sun. The Moon still has to take an additional two days to return to its own starting position. The phases of the moon are determined by the relative positions of the Earth, Moon and Sun, so the Moon phases are the same for everyone on Earth. The Full Moon rises about sunset. Each night, it comes up about 48 minutes later. This is an excellent time to do The Moon Salutation, if you want to connect to the Moonrise in the same way that you do with The Sun Salutation at Sunrise. (I'm not that ambitious, but I wish I could be.) I'm up all night working by the light of the moon instead! And when one considers the fact that only 10% of the Sun's light is reflected by the Moon...the whole process becomes magical—at least to me. Julius Caesar brought the calendars from Egypt in 33 A.D. Pope Gregory created the Gregorian calendar in the 1500s, but it was from the Egyptian calendar—based on the 7-day week. If you want to learn more about calendars, read about their history online. The facts are quite surprising. Obviously, it is a good idea to learn how to know the Moon and all its phases, attributes, changes, and so much more! Farmers and anyone who works with the earth have learned this from direct experience. Clear Moon without halo—nice weather. Air around Moon thin and reddish and somewhat out of focus with the dark part of the Moon apparent—be prepared for wind. Murky, pale or thick—a storm might keep you indoors. If the halo is clear and fading gradually—fair weather. If there are two or more halos—stormy. If the halo is split or yellow in color—windy storm. If the halo is misty or thick—Winter wonderland. If the halo is split and pale—storms, winds or snow.